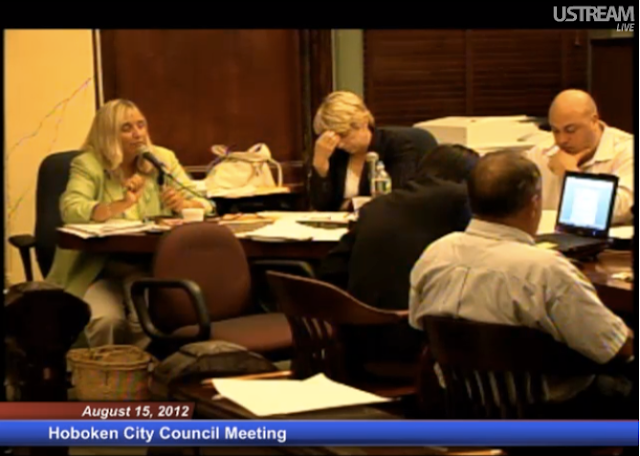 In the first of an anticipated two part legal process on the Old Guard council minority lawsuit challenging Jim Doyle's council appointment, Assignment Judge Peter Bariso agreed five votes of Hoboken's eight member City Council are required nullifying the appointment. Two council 4-3 votes leading to Jim Doyle filling the open at-large seat in consecutive council meetings last month did not include Beth Mason and Michael Russo. Neither called in to the council proceedings via teleconference (phone) to vote on the at-large appointment. According to well placed sources attending the legal proceedings Friday, Judge Bariso followed the limited ruling saying he anticipated an application to see the City Council members reconvene as a body of the whole and vote on the open at-large seat. The expectation of an application from the City seeing all eight members of the City Council voting on the open at-large council seat may lead to a potential fifth and deciding vote placed by Mayor Dawn Zimmer. Failure for members to attend and or vote by teleconference if a ruling is made to see a vote of the full body in the same session could see that council member held in contempt of court. The judge said he would entertain arguments on both sides when an application is brought before him. For the moment, Jim Doyle is not a councilman and the next council meeting is scheduled for November 28th. A vote at that meeting of all eight existing council members may be on the agenda. Oh vey! Judge's limited ruling Friday isn't the end of the Jim Doyle appointment. from her council responsibility in showing up if the Court calls for a vote. Talking Ed Note: The case is going into overdrive. Clearly, a second round will be on the table when the City's attorney(s) submit an application. It's uncertain when one would be presented with Thanksgiving next week. Jim Doyle's status is in limbo with his appointment declared one vote short. Any 5-4 votes where he was the deciding vote in the last month would need to be revisited. All Mason can do for now is underwrite another court proceeding but the writing is on the wall. The Beth Mason - Michael Russo scam is being called in this latest Old Guard action attempting legal obstruction. Pony up!